The LEDiL Selector Kit from ILS is the latest development kit designed to explore which secondary optic works best with OSRAM OSLON® LEDs. There are 4 types of LEDiL selector kits which represent each member of the OSLON® family; OSLON® 80, OSLON® 150 and OSLON® Square (120). 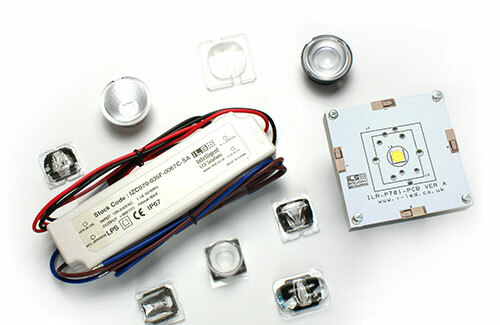 The fourth kit contains all 3 OSLON® SSL LEDs within the same box. The LEDiL Selector has been designed to work with most single source optics from LEDiL and can be connected to an LED driver thanks to the on board connectors. OSLON® SSL 80 and 150 can be driven up to 1300mA whilst the square can be driven up to 1800mA while OSRAM’s power chip technology remains efficient even at the highest drive currents. A very low thermal resistance ensures cool running and a highly efficient product. The LEDiL Selector board from ILS is the latest light engine designed to explore which secondary optic works best with OSRAM OSCONIQ P7070® LEDs. The LEDiL Selector has been designed to work with most single source optics from LEDiL and can be connected to an LED driver thanks to the on board connectors. The LEDiL Selector board from ILS is the latest light engine designed to explore which secondary optic works best with OSRAM DURIS S10® LEDs. 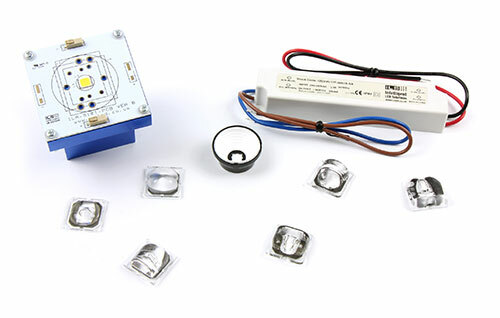 The LEDiL Selector has been designed to work with most single source optics from LEDiL and can be connected to an LED driver thanks to the on board connectors.